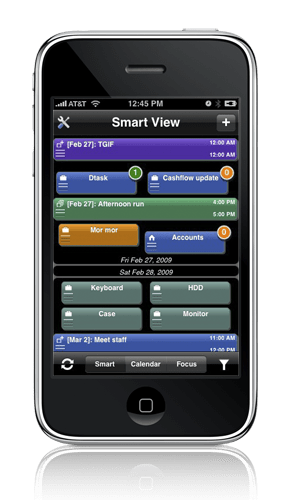 Left Coast Logic’s "SmartTime+": Automatic scheduling based on tasks and events, if only it worked. The company Left Coast Logic has a neat application, SmartTime+. It fills a niche I’ve sensed for years: I have all these tasks, and some of them have due dates. I know some of them are quick (like 15 minutes) and some are long (like 4 days of work). I also have some events scheduled, like meetings and a break for lunch. And I almost forgot: sometimes emergencies happen and I can’t work according to the schedule. So re-arrange things when I’m unable to meet the schedule. Now something please tell me what I’m supposed to be doing every hour. SmartTime+ tries to do this. It lets you enter this information, and it will create a schedule. It will even synchronize the calendar with Google Calendars. It’s very clever, and has a lot of potential. Unfortunately, the scheduler just doesn’t work. The scheduler is the weakest part in SmartTime+ 3.0. In particular, in some cases, it’s unable to produce a schedule that satisfies the deadlines, even though it’s possible to create such a schedule. It’s a frustrating bug that renders the automatic scheduling useless. Hopefully, SmartTime+ is only the first active scheduling system. If Left Coast Logic doesn’t get going, I’ll hope to write something myself that works with Google Calendar and Google Tasks to accomplish the same job, minus the iPod/iPhone. Left Coast Logic: PLEASE work on the scheduler. Don’t waste your time elsewhere. I have followed-up by opening a support case with Left Coast Logic.